I'm quite sure this is about climbs, not grovels...? >I'm quite sure this is about climbs, not grovels...? What are you talking about? That looks like fantastic fun. Count me in. Buggered if I know where it is though. Looks a little Eborish, but In don't know the area well enough. Helps when one takes the pic eh. I hope this flickr pic shows up here. Frog frog frog frog frog. wondered when you would find this game phil. yes it does help when you take the photo. Nice photo of grant. Cover photo of Andy's Frog guide I believe. I won't answer as I do not have a photo with me. A sightly obscure route here. I'll be interested to see if anyone knows it. I initially had it flipped horizontal. That would have made things hard. >I hope this flickr pic shows up here. Double points if you name the climber. 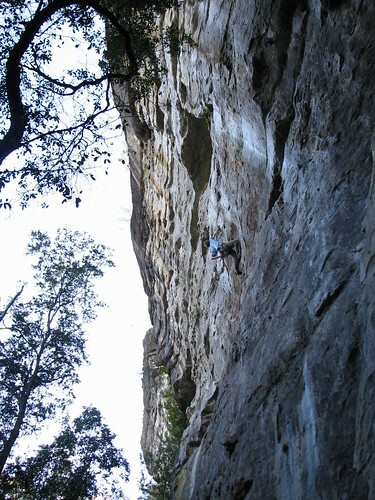 That would be drop zone @ nowra... timbo in the c--kpit?